On the web page, "Polynomial vocabulary" we are going to see definitions of terms being used in the topic polynomial. A polynomial is an algebraic expression, in which no variables appear in denominators or under radical signs and all variables that do appear are powers of positive integers. 3x³ y² is a polynomial in the variable x and y. Terms are expressions or numbers that are added or subtracted. In the given algebraic expression, we have three terms. The degree of the highest degree term that appears with non zero coefficients in a polynomial is called degree of the polynomial. The highest power of the given polynomial is 3. Hence the degree of the polynomial is 3. We can classify polynomials based on the number of terms. A polynomials which have only one term are known as monomials. We can classify polynomials based on the number of terms. A polynomials which have only two terms are called binomials. "5x - 3 y" and "5x³ + 7x" are binomials, because they have only two terms. We can classify polynomials based on the number of terms. A polynomials which have only three terms are called trinomials. We can classify polynomials based on the degree. A polynomial of degree zero is called a constant polynomial. p(x) = c, where c is a real number. We can classify polynomials based on the degree. A polynomial of degree one is called a linear polynomial. p(x) = ax + b, where a and b are real numbers and "a" is not equal to zero. We can classify polynomials based on the degree. A polynomial of degree two is called a quadratic polynomial. p(x) = ax² + bx + c, where a, b and c are real numbers and "a" is not equal to zero. "2m² + 5m - 3" is the quadratic polynomials. We can classify polynomials based on the degree. A polynomial of degree three is called a quadratic polynomial. p(x) = ax³ + bx² + cx + d, where a, b, c and d are real numbers and "a" is not equal to zero. "5x³ + 7x", "30m³ + 3m² - 163m + 5" are cubic polynomials. A numerical or constant quantity places before and multiplying the variable in an algebraic expression is called coefficient of the variable. Hence 2 is the zero of the given polynomial. If x = a satisfies the polynomial equation p(x)=0, then x=a is called root of the polynomial p(x)=0. Hence 3 is the root of the polynomial equation. 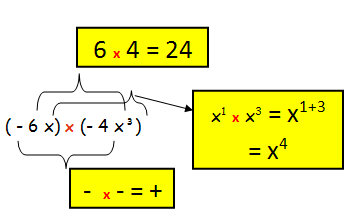 Adding and subtracting polynomials is the method of combining the like terms. The two given polynomials are already in the arranged form.So we can leave it as it is. Now we have to write the like terms together starting from the highest power to lowest power. Distributing each term of the first polynomial to every term of the second polynomial is called multiplication of two polynomials. After having gone through the stuff given above, we hope that the students would have understood "Polynomial vocabulary". Apart from the stuff given in this sectio n "Polynomial vocabulary", if you need any other stuff in math, please use our google custom search here.